And now we come to the liver, one of my favorite organs. Certainly the heart, the brain, and the immune system get more play in the popular imagination than the liver, but that's only because the liver is so misunderstood. Next to the skin, the liver is the largest organ in the body. In many ways, it is the most important organ, and the last to be considered when it comes to health. In addition to being large, the liver is also a complicated organ involved in at least 200 separate functions. Generally speaking, the liver performs a vital role in regulating, synthesizing, storing, secreting, transforming, and breaking down many different substances in the body. In this issue, we explore the anatomy and physiology of the liver in detail from a natural health perspective, and conclude with a discussion of how the body regulates cholesterol and why statin drugs may not be all that doctors promote. As I mentioned above, the liver is the heaviest and largest gland inside the body, weighing in at about 3 pounds. Only your skin (also a single functioning organ) is larger. Your liver occupies almost the entire right upper quadrant of the abdominal cavity. (Remember that in virtually all medical diagrams, right and left are reversed.) It nestles up against the diaphragm on the top and against the ribs on the right -- stretching across the body, almost touching ribs on the left. Thus, barring extreme trauma such as bullet wounds and automobile accidents (or if it is not enlarged), it is fully protected -- a testament to how important the body considers the organ. Physically, it is divided into four lobes, a large right and a small left lobe. Nestled between those two lobes are two less easily visible lobes, the quadrate lobe sitting on top and the caudate lobe sitting just underneath and extending to the bottom of the liver. Obviously, a three pound organ cannot just "hang" in the abdominal cavity. It needs to be secured. And in fact, it is suspended from the back of the diaphragm by two ligaments, the falciform and the suspensory ligaments. The falciform ligament in particular runs up through the entire liver, dividing the left and right lobes before attaching to the diaphragm. There is one other interesting note about the falciform ligament. The umbilical vein, when you are inside the womb, runs from the umbilical cord up between the left and right lobes of the liver. Within a week of birth, that vein is completely obliterated and replaced by the fibrous cord known as the falciform ligament. The liver has a reserve capacity of some 50-80%. That means you can destroy up to 80 percent (and in some cases possibly even more) of the liver's function and have no demonstrable negative symptoms. And as amazing as that is, it's not the most amazing part. As I have mentioned frequently over the years when talking about detoxing the liver, the liver is one of the few human organs that can regenerate itself. It can actually regenerate (in a matter of weeks) up to an 80% loss of tissue. Once regenerated, it will fill the same space it occupied before, and will take roughly the same shape as before. And when it's done regenerating, it stops! Though it grows faster than any cancer known to man, its regeneration does not become malignant, and the liver will stop growth at approximately its normal size. This is particularly useful after trauma such as an automobile accident that has damaged part of the liver. The damaged or diseased tissue can be removed by the surgeon with no loss of liver function, and in a matter of a few weeks, the liver will have regenerated all of its lost tissue. You've gotta love this stuff! Before we begin discussing the liver's blood supply, which is unique in the body, it should be noted that everything in the liver begins with the three letters "hep", as in hepatic or hepatitis. The right lobe of the liver is served by the right branch of the hepatic artery (a branch of the celiac trunk). The left branch serves the left lobe. Venous drainage occurs through the inferior vena cava, which cuts across the liver from top to bottom and receives venous drainage from the hepatic veins. So far, nothing very interesting. But dig a little deeper and we find that the liver is unique in the entire body. In fact, the liver has an entirely separate circulation system to accommodate its special needs and functions. This is called the portal system. As it turns out, all the physiology and pathology of the liver depend on this specialized circulation system. Functionally, the hepatic system is a venous system, ultimately returning used blood to the heart for reoxygenation. But unlike every other part of the venous system, it serves a second, even more important function. 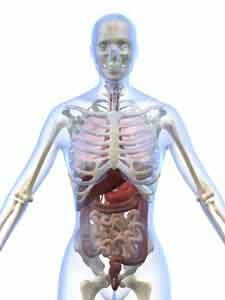 The portal system actually takes all of the veins that drain the organs of digestion and instead of returning their blood directly to the heart passes it through the liver. Effectively, the portal venous system is responsible for directing blood from parts of the intestinal tract to the liver. All of the substances that you process and absorb in your small intestine must first travel to the liver for a final processing before continuing to the heart. In addition to the small intestine, the portal system also includes venous drainage from the spleen and pancreas. So what is being processed in the liver? Ultimately, we are talking about all of the protein, fat, and sugar molecules broken down in your digestive tract -- and all of the vitamins and antioxidants. Every nutrient you consume flows from the intestinal tract, through the portal system, and into the liver for processing and extraction. The liver thus plays a primary role in the digestive process. Specifically, the portal vein drains the inferior mesenteric vein, the superior mesenteric vein, the splenic vein, the gastric veins, and the esophageal veins. As you can see from the diagram, all of these veins dump into one vein, the inferior vena cava, just before it enters the lower part of the liver. From there it splits into many progressively smaller veins that ultimately reach every single cell of the liver before reversing the flow and reassembling, once again, as the inferior vena cava that exits through the top of the liver on its way back to the heart. As a side note, many drugs that are absorbed through the intestinal tract are substantially metabolized by the liver before being parceled out for general circulation. This is the primary reason that so many drugs list liver damage as a notable side effect. On the flip side of the coin, processing by the liver "inactivates" some drugs, thus they cannot be taken orally. Nitroglycerin, for example, cannot be swallowed as it would be neutralized by the liver. Thus, it is taken under the tongue and absorbed sublingually, totally bypassing the portal system and the liver. Other drugs are administered through skin patches so they can be absorbed transdermally, once again bypassing the portal system and the liver. As mentioned above, and as befits the special function of the portal system, the inferior vena cava does not continue as an uninterrupted thoroughfare through the liver. In fact, the portal system divides into a capillary bed of ever smaller venous capillaries in the liver sinusoids (see diagram below) formed by the cells of liver. It re-forms on the other side of the sinusoids as the hepatic capillaries and veins, which drain into the vena cava. Effectively, it is a venous-capillary-to venous-capillary system. Okay, we've laid out the location of the liver and the unique blood supply that supports it. Now let's talk about the structures inside the liver that do the actual work. Liver lobules (aka hepatic lobules) are the microscopic working factories located inside the lobes of the liver. Sinusoids are small swellings or "plates" between hepatocytes that act like small capillaries. Hepatocytes are the liver cells that do all the actual work of the liver. The hepatic lobule is the structural unit of the liver. It consists of a roughly hexagonal arrangement of plates of liver cells radiating outward from a central vein in the center. Each lobule is approximately one to two millimeters in diameter, with tens of thousands of lobules per liver. At the vertices of the lobule are regularly distributed "portal triads," containing a bile duct and a terminal branch of the hepatic artery and portal vein. The lobule is composed of multiple smaller units, called acini (which are just the grouping of cells at the end of each sinusoid) and is artificially defined into three zones, with Zone I closest to the portal vein and Zone 3 closest to the hepatic venule in the center of the lobule. Organization of the functional parts of the liver into lobules and acini between the portal vein and the hepatic vein allows for an easy exchange between the blood and the liver cells and a gradual filtration of blood as it moves through the sinusoids from Zone I to Zone 3. Contrary to blood flow, bile flows in the exact opposite direction, from Zone 3 to Zone I via a separate route to the portal bile ducts. To summarize, nutrient-rich blood enters the liver via the hepatic artery and portal vein (remember, portal venous blood is rich in nutrients.) The blood from these two sources merges as it enters the sinusoids. Blood reaches the hepatocytes by detouring through capillaries at the sinusoids, where exchanges take place. The exchanges are made as the liver requires according to what zone the blood is in -- nutrients in, waste out, alcohol removed, etc. Blood then exits the lobule via the central hepatic vein, ultimately reentering circulation through the inferior vena cava that exits through the top of the liver. Note: the depleted blood returning from the legs and lower body is not involved in this exchange. It does not enter the liver. It is not altered in any way. Only the rich venous blood from the portal system is involved with the liver exchange before returning to the heart. Sinusoids are vascular channels lined by hepatocytes. As blood flows out of the hepatic arteries and portal veins, it flows through the sinusoids for "processing" by hepatocytes before it ultimately empties out through the central vein of each lobule, the hepatic venule, from where it ultimately makes its way to the heart. In addition to normal processing by hepatocytes, liver sinusoids are equipped with Kupffer cells that literally devour foreign pathogens such as bacteria that enter the sinusoids. As a side note, Kupffer cells are particularly vulnerable to damage from alcohol. Liver cells do the primary work in the liver -- everything from extracting oxygen and blood, to synthesizing cholesterol, to breaking down fats and sugars, to neutralizing toxins. That said, it's a little more complicated than that. In fact, although virtually all liver cells are fundamentally similar, their function varies according to their location in the liver lobule. Zone 1 cells, for example, are located near the blood vessels that bring oxygen rich blood and nutrients into the lobule and are adept at oxidative liver functions such as cholesterol synthesis, the oxidation of fatty acids, glycolysis (the process that breaks down sugar for energy), gluconeogenesis (the formation of glucose), and lipogenesis. Zone 3 cells, on the other hand, specialize in detoxification. First, and probably foremost, there's protein synthesis. The liver synthesizes proteins from amino acids. It takes amino acids and assembles them as needed into complex proteins. It makes almost all prothrombin and fibrinogen (clotting factors), as well as albumin, the major blood protein. It also converts forms of amino acids from one to the other when needed for specific proteins. It converts toxic ammonia (from amino acid conversions) into less toxic urea (which is excreted). It uses amino acids and proteins for energy production or storage as fats and carbohydrates. The liver is the storehouse of carbohydrates as glycogen (glycogenesis) and lipids (lipogenesis). It can rapidly break down large amounts of CHO (glycogenesis) and release it as glucose into the bloodstream. It can create glucose from lactic acid (gluconeogenesis). The liver can store fats in various forms. It can break down and release stored fat for extraordinary needs. It cleanses the blood and discharges waste products. The liver also excretes bilirubin, the broken-down pigments from dead red blood cells, by metabolizing it with bile salts and excreting it through the feces. Bilirubin is what makes our feces brown. If for some reason, bilirubin is not excreted (as in obstructive jaundice) the feces will turn clay-colored. It neutralizes and destroys poisons and metabolizes alcohol. The liver also detoxifies drugs and chemicals and virtually any toxin that enters the body. It excretes those toxins in two ways. It neutralizes them and releases them into the blood, where they make their way to the kidneys and on out through the urine. 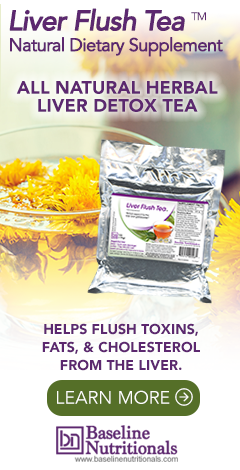 It dumps the toxins directly into the bile and, thence into the intestines for excretion. It aids the digestive process by the production of bile, which is used for the breakdown of fats in the intestinal tract. It helps the body resist infections by producing immune factors and by removing bacteria from the bloodstream. It converts (conjugates) vitamin isolates as found in your vitamin pills into non-toxic forms your body can actually use -- and can then store some of those vitamins and minerals (iron and copper, for example) to be used as needed. In fact, the liver stores all the fat-soluble vitamins (A, B12, D, E, and K, for example). Water soluble vitamins such as vitamin C, on the other hand, are not stored in the liver and need to be taken daily, as any excess is expelled in the urine. In addition, the liver is responsible for "activating" vitamin D so that your body can utilize it. It helps maintain the body's hormonal balance. It regenerates its own damaged tissue. And it synthesizes cholesterol from fatty acids and removes excess cholesterol from the bloodstream as required. In previous newsletters and in Lessons from the Miracle Doctors, I've covered the range of misinformation relating to cholesterol and heart disease. In this newsletter, I want to cover a different aspect of cholesterol -- how the body regulates it and, therefore, what we can do to optimize that process. It is also essential in the formation of every cell membrane in your body, not to mention the fact that your brain is mostly made up of cholesterol -- much of it in the myelin sheaths that insulate nerve cells and in the synapses that transmit nerve impulses. As a fat soluble molecule, cholesterol cannot easily be carried in the blood -- a water based medium. Therefore, the body converts cholesterol into water-soluble molecules known as lipoproteins so it can be transported. Lipoproteins are composed of an outer shell made from a phospholipid which renders the particle soluble in water, a core of fats (lipids) including cholesterol, and a surface protein molecule (apolipoprotein) that allows tissues to recognize and take up the particle. Lipoproteins are characterized by their density: high density lipoprotein (HDL), low density lipoprotein (LDL), very low density lipoprotein (VLDL). In simple terms, HDL lipoproteins are good for you. LDL lipoproteins "theoretically" promote arterial build up and are bad for you. Diet accounts for about 25% of the cholesterol levels in your body. Your liver synthesizes about the same amount, and the rest is synthesized in organs such as the intestines, the adrenals, and the reproductive organs. Obviously, trying to control cholesterol levels by solely changing diet will be effective only if levels are slightly out of whack. Although keep in mind, controlling diet is not just a question of regulating the cholesterol or fats that you eat; it is also a question of the soluble fiber (such as oat bran and psyllium husks) that you eat and which absorbs cholesterol and carries it out with your feces so that it never enters your bloodstream. Unlike dietary changes, statin drugs seek to stop cholesterol formation in the liver by inhibiting a biochemical called 3-hydroxy-3-methylglutaryl coenzyme A reductase, which is required for cholesterol synthesis. Unfortunately, the reason for high cholesterol levels is only rarely due to over production in the liver; it is primarily the result of inadequate removal from the body. That means that statin drugs are not going to be the cause of the problem, but are addressing a symptom by artificially suppressing a properly functioning mechanism in the body. In scientific terms: that can't be good. We'll talk more about that later. But for now, let's talk about how your body actually regulates cholesterol levels. As it turns out, your liver not only manufactures and secretes LDL cholesterol into the bloodstream; it also "down regulates" or removes LDL cholesterol from the bloodstream. In general terms, your liver oxidizes the cholesterol into a variety of bile acids which are then "pulled into the liver," carried into the bile ducts, and then on out through the intestines. As a side note, if the cholesterol becomes too concentrated in the bile and sits too long in the gallbladder, it can crystallize and form gallstones. (We'll talk more about gallstones in the next issue of the newsletter.) In any case, that's the general description of the cholesterol removal process. To understand exactly what's going on here, we need to examine it in a little more detail. As it turns out, a healthy liver has a large number of active LDL receptor sites sitting on the surface of all the liver cells. When present and functioning properly, these receptor sites are associated with the rapid removal of LDL cholesterol from the blood -- and consequentially low blood LDL cholesterol levels. So why do these sites sometimes not perform as advertised? Some people have an inherited genetic disorder (familial hypercholesterolemia) that causes them to be born with either a diminished number, or even zero, LDL receptors. For those people, statin drugs are a necessity. If the liver can never clear excess cholesterol, you have to stop production of cholesterol at its source. Some people, on the other hand have normal receptor sites but as the result of bad diet literally clog up their livers so that the cholesterol cannot clear the receptors -- thus stopping the process of LDL removal. For these people, statin drugs are probably not the best "first" option. How many of each are we talking about? The genetic condition affects maybe one in 500 people. For everybody else, we're talking about a self inflicted condition. In other words, the vast majority of cases of high LDL cholesterol are caused by a dietary inflicted blockage of the liver's LDL clearing mechanism. In fact, blockage occurs in two distinct places in the liver. First, fatty deposits can build up in the sinusoids, which prevents the bile from entering the bile ducts and physically clearing the liver -- essentially clogging the liver. Second, and more importantly, excess dietary fats can actually cause ingested cholesterol to build up in the membranes of liver cells, thus crushing the ability of those cells to process Sterol Regulatory Binding Protein (SREBP), which as its name implies, activates the gene in the LDL receptor site to tell it to take up cholesterol from the bloodstream. This literally stops the receptor sites from functioning as receptors -- totally shutting down the flow of cholesterol through the liver and on out through the bile ducts and colon. Depending on how many liver cells are blocked, this can lead to anything from a minor rise in cholesterol levels on up to a "your doctor is screaming at you" level. In any case, the use of statin drugs does nothing to change this underlying problem. They merely force your body to work around it. Fortunately, there are options. If you can flush the excess fats and cholesterol that are unnaturally stored in the liver, your body's mechanism for regulating excess LDL cholesterol in the bloodstream will once again function properly -- automatically lowering your cholesterol levels. This is actually not that hard to do, although medical doctors have no idea how to accomplish it. It's called a liver detox/flush, and we will explore it in detail in the next newsletter. Before we go, a couple of notes on statin drugs. I'm not very big of them for a number of reasons, including the fact that they have all kinds of side effects. But more to the point, they do nothing to address the underlying cause of high cholesterol levels for the vast majority of people who have the problem -- the clogging of your body's self regulating mechanism. Oh, and as a minor point, the connection between cholesterol and heart disease is not necessarily as automatic as you have been led to believe. But most significantly of all, one of the side effects of statin drugs is liver failure. Now, given the understanding you now have of what has caused the problem in the first place, how much sense does it make to take a drug that potentially destroys the one mechanism in your body that actually down-regulates cholesterol? Very good article easy to understand. Great article: much more in-depth and informed than most stuff on the internet but also very readable. Thank you. I would like to hear Jon's comments on how those people who do suffer from HyperFamilial Cholesterolemia (i.e. the one in 500) should manage their condition. In this article, Jon states that for such people, statin drugs are a necessity. But are there any approaches to dealing with FH which do not require statins? Could the condition be managed with a combination of dietary approaches, exercise, detox procedures, and supplements such as niacin, b-vitamins, fish oil, resveratrol, green tea etc? Some such approach could be followed while monitoring cholesterol levels, and gradually reducing dosage of (and dependance on) statins - perhaps being able eventually to eliminate them altogether? Thanks for a great article. And for all the other great articles! I fall into the FH category as well but I can not take Statins because of severe leg muscle cramping and pain. I also get bad gas from oats and Celium husk( I think that's the name). I feel lost and frustrated. My HDL are very high because I exercise regularly and have a healthy diet, but my LDL have always pushed my overall count too high. My doctor doesn't have alot to offer either because I'm ' doing everything right'. I'm very interested to hear of an approach that can help with my problem. A retired diplomat from Tehran,Iran,Age 74,with 2 stents in coronary arteries,the circumflex. Almost all of Jon's articles begin with a summary of what's to come and end with a section telling you what action steps to take. However, those action steps almost always require more than two lines as Jon insists that people need to be told why they need to do something. That said, we will try to be more conscious of providing effective summaries...where applicable. I am an ardent reader and subscriber of your newsletter as well as some of your basic supplements.I really enjoy and acquire a lot of healthful information from these articles.I always eat healthy foods and take supplements but every time my problem is high cholesterol level specially the LDL.I take cholesterol regulating supplement but still the figures are the same.My doctor said that It might be in my family genes.I used to take statins but stopped.This article gave me a detail explanation on why my liver will not flush the excess fats.Thank you very much and more power to you. My cholesterol is 180 and my dr. is advising that I quit eating eggs (I eat organic,free range), eat meat 3 times a week and drop dairy which i have once a day in my one and cup of coffee. I have been lead to believe from several nutritionists that eggs and meat are not the root cause of cholesterol rather it is carbs. Whom do I believe? What are your thoughts? You talk about 1 in 500 being genetically predisposed to high cholesterol. What about the LDL particle size we are reading about? If the particle size is the right kind, why would these people need statins? The genetic predisposition is specific to LDL cholesterol. Here are the specifics. Cholesterol is delivered to cells via the bloodstream. Normally, the tiny particles of LDL cholesterol attach to ‘receptor’ sites on the targeted cells and are then absorbed. A gene on chromosome 19, called the LDLR gene, controls the production of these receptors. Familial hypercholesterolaemia is due to a mutation of the LDLR gene that changes the way the receptors develop, either in number or structure. This means that LDL cholesterol is not well absorbed into cells, and remains circulating in the blood. The bottom line is that the genetic problem causes LDL numbers in particular to rise. If one is genetically predisposed to high cholesterol, does this mean that one's levesl will be high throughout one's life? Or, can high cholesterol kick in later in life? Also, what is the relationship between Hashimoto's hypothyroidism and high cholesterol? Finally, is there a connection between menopause and the development of high cholesterol? Thanks so much. I am new to your newsletter and find it extremely interesting and thorough. I found this site interesting. My son was born with liver damage, less than 10% good cells from the biopsy done at five weeks old.He is now an adult and has problems controlling cholesterol. Diet is obvious, but is it worth trying drugs ie. statins?He has had so much medical intervention I am not keen for him to use more drugs. Any advise? I have been researching high cholesterol. My total is 256 as of 2-12-14. I am 66 yo female. HDL is 53, Trig is 141, but LDL is 175. This has come about in the last year or two. Just gradually creeping up. There is no genetic predisposition to high cholesterol. Both my parents however had their gall bladders removed because of disease. I am increasing my exercise at the gym to the best of my ability. I have a mild heart murmur and take med for hypertension, a condition that is hereditary. I own a landscape and garden design business, so my outdoor activity is high as I work with my crews. My diet is not loaded with fatty foods. My father in law had high cholesterol, so we changed alot of ways of cooking to accomodate him and those low fat, no fat, no trans fat methods of cooking and food selection have stayed with us the last 20 years. I can increase eating more fish and increase my exercise. But if the gall bladder and/or liver is malfunctioning, what tests need to be done to find out if I need the gall bladder removed? The doctor immediately wanted to put me on Zocor and I refused because of a lack of history with this problem. I said I wanted to try improving my diet and exercise first. I had also suffered with about a 3 mon. bout of bronchitis which stopped me from exercising regularly and being active. Am I on the right track by improving diet, increasing exercise and getting rechecked in 6 weeks? Is there another test the dr needs to do to check the functionality of the gall bladder and liver?? Very good illustrations and explanations. Easy to understand and helpful. Just want to share too, if you have learned and study Hand or Foot reflexology. I didn't study it in schools. But I was taught by Dr. Gabuelo who studied in 5 different countries and completed the course for 5 years. And I learned from him. That if you applied this accupressure on each pressure points in your hands/foot-for 3 to 5 minutes, it revitalized your organ, like your liver, as you applied pressure(by press & roll) it produces it's own natural electrical conduction in the body, and the natural heat has a healing effect, or it revitalized the cells in the body. So, if the liver has been revitalized, then he can do his work properly, so people who has problems with sick liver or other organs of the body by genetics, or whatever disease, if it's been revitalized then it will be strong and lively again, and by the help of doctors prescribed medications it works much better. And now a days, doctors can do more investigations to know where the problems are, and if you add & applied this accupressure, its ok, as it's natural, you are not using chemical, you are just using tender loving touch on hands and foot. Our body works naturally. Created by God. But if you abuse it, it has consequences. So handle with care. As to my experience to myself & friends, it helps and works. You can try it and find out for yourself. This was excellent. I am more interested in liver gallbladder flush. As always, a GREAT article! Your team produces some of the best information I've ever seen. The writing and explanations are very clear and make complex subjects easy-to-understand! Click on the "How To Detox" link at the top of the page for detailed instructions on all detoxes, including the liver. Thanks for a really excellent article on liver function and its relationship to cholesterol but can you explain why the liver produces LDL. Its always described as bad LDL but surely it must perform some useful function. Calling HDL good and LDL bad is a bit of a misnomer. HDL is labeled good because it transports excess cholesterol from peripheral tissue TO the liver for excretion. And yes, that’s good—especially because modern diets push cholesterol levels so high. LDL, however, is only bad in excess. It transports cholesterol FROM the liver to all the tissue outside the liver for utilization. My doctors advice focuses on getting LDL down as low as possible, but if the LDL supply is crucial to body tissues there must be a minimum safe level we never hear about. If the safe level is well below the norm then why does the liver constantly over-produce. For a better understanding of what cholesterol is and how your body regulates it, check out https://jonbarron.org/article/understanding-liver-and-cholesterol. I have test results that indicate my LDL and triglycerides are high. I have asked to not go on meds until I investigate. I have autoimmune thyroiditis and Crohns and don't wish to add meds that can damage my cells or organs! However, I'm reading that if my arteries are clogged, the statins will help the Blood vessels to absorb the cholesterol, but nothing else does.